Tired of hosing off bird droppings from your car/SUV/camper or boat? 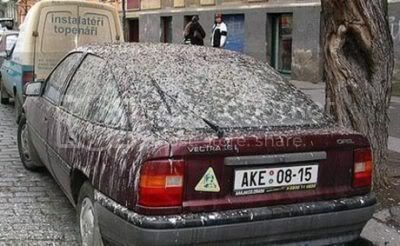 Have you run out of car soap in scrubbing off bird poop? Unless you’ve implemented effective bird control measures to keep pest birds off your vehicles and boat, these acidic droppings will eat into the paint and cause permanent damage. So you’re more or less stuck whipping out your hose and sponges every day, cleaning off those smelly droppings—droppings that can carry any of 60 known diseases. Bird droppings damage paint when the cooling paint lacquer contracts and hardens around their deposits. When exposed to sunlight, bird droppings dry and harden. At the same time, paint lacquer heats up in sunlight, causing it to soften and expand. When the paint lacquer cools down at night, it contracts and hardens around bird droppings. Left for any length of time, the droppings will eventually etch the paint. Some vehicle and boat owners have resorted to canvas covers. But these, too, must be cleaned often or the bird droppings will harden, weaken the fabric and cause it to rip and tear. Vehicle covers, especially boat covers, are not cheap. While they may not have raebbit ears, birds have very acute hearing. They’re always on the alert for a fellow bird in distress or the threatening shriek of an approaching predator. Sonic Bird Deterrents deliver the message, broadcasting recorded distress and predator calls that make birds far too nervous to stay around your driveway. The sounds they emit resemble normal bird sounds to humans, so you don’t have to worry about neighbors complaining or your dog or car rushing for cover. The best sonic deterrents will be versatile enough to emit a number of sounds. One sonic bird deterrent currently available can generate distress and predator calls for 22 different species of birds. It’s basically “dial sound” and forget about pest birds. Look for sonic deterrents that feature a built-in speaker, a volume control, and one that lets you program it to turn on or off at night. If you’re on a budget, these versatile bird deterrents will keep pest birds away from your vehicle or boat. They include inflatable balloons--covered with predator eyes—that sway in the breeze to convince pest birds there’s a big predator just aching to eat them. Scare eye diverters are similar to balloons in that they feature a big eye that spooks birds even thinking about landing on your car or boat. For best effect, you would typically hang these deterrents from your garage (for cars/SUVs), or tied to your covered boat or camper. Just make sure you move them about from time to time or birds will get wise to them.